This tab is on sale at amazon for $100 off. Don't know how long it will last. Mr. anti-home key, 08 Jul 2013seriously a home button for that 10.1 crap ? the third time that Samsung give a damn about the... moreGoogle have alot involved in this design. Android 4.2 changes to giant phone UI. If samsung remove the buttons, the screen real estate will drop by 20% due to the top status bar + bottom bar. and looks worse then NOT having buttons. Look at the shameful UI.. Personally google is stabbing themselves by destroying the beautiful and highly usable 10 inch tablet factor from honeycomb. Future of android tablets (10 inches) looks blink. AnonD-161820, 06 Jul 2013Why did you say that ALL Samsung's tablets are pathetic? Some are ”pathetic”, but these have c... more!!???? Worse.. Google have not help much in tablet applications. All looks like giant phone UIs. Even much so in 4.2.. after they unify tablet UI/Phone UI. Looks like even samsung is not interested in premium tablets market. Tablet world still belongs to iPad. People still buy these other things called "tablets" and not iPad? goddam!! the galaxy tabs have always been useless. the only place Samsung succeeds is with the Galaxy S and Note lineups, the rest of the mobile devices are just utter crap. According to iXBT review Max Payne is unplayable on GT 3 10.1 - buggy and laggy. Dark Meadow and NFS MW won't launch at all. Modern Combat 4, Shadowgun had performance issues. NOVA 3 levels loading too long (I/O performance issues). GTA, Dead Space and Carmageddon are not tested. Myabe samsung are planing on the tabs being mid range and the galaxy note 3 10.1 being the high end tab? maybe. The problem for Samsung is that there are so many variants customers don't know what year and which one is which. w.s, 06 Jul 20131gb ram night do the trick but imo ita a dealbreaker. It's summer '13 and people will be buyin... moreIf someone wants more RAM on their tablet they'll bypass this one for other tablets which have 2GB (such as the Xperia tablet). Also, isn't the upcoming Note III going to have 3GB RAM? 800 x 1280 pixel resolution ????????????????????????????????????????????????­????????????????????????????????????????????????­????????????????????????????????????????????????­????????????????????????????????????????????????­?????????????????????????????????????????? AnonD-161820, 06 Jul 2013Why did you say that ALL Samsung's tablets are pathetic? Some are ”pathetic”, but these have c... moreAtive Q is windows 8 laptop with capability running Android, this had nothing related to standard android tablet and it price hilarious! That kind of price make it not worth to get it. Nexus 10 is superb unstable, lucky I manage to sell it. Others than this, none of Samsung android tablet considered good. dara, 06 Jul 2013These are the reasons that iPad presents in huge segment of tablet market. 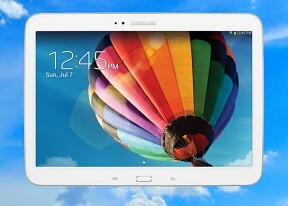 Samsung might g... moreThis is not a high-end tablet! Nexus 10 and ATIV Q are high-end tablets! AnonD-52738, 06 Jul 2013All Samsung tablet is pathetic on spec. (Ignore that not stable Google Nexus 10 which not 100%... moreWhy did you say that ALL Samsung's tablets are pathetic? Some are ”pathetic”, but these have cheap prices. There are high-end tablets from them and one of them I think is the best Android tablet and one of the best Windows 8 tablets: Samsung ATIV Q! Made with magnesium alloy, with an Intel Core I5 Haswell processor, 4 GB of RAM and the biggest resolution on a tablet: 3200 x 1800!!! Here: http://www.androidauthority.com/samsung-ativ-q-s­cores-54861-antutu-benchmark-234204/ ! And it also have a full keyboard beneath it! And yes, Nexus 10 is also the work of Google but most of the tablet is Samsung's idea. Its design proves it! So, OUCH with your comment!